Supreme Air provides Air Conditioning, Heating and Plumbing Services, Repair, Installation, Maintenance, and Tune Up in Edgewater, MD and surrounding areas. Service was, first, spot on time. That is rare these days. More importantly, the service was first rate, performed by a very competent, thorough and courteous professional, Chris. Thank you Mr. Waddell, we appreciate you taking the time to write this review. We know your time is valuable, that's why we make it a priority to arrive on time, as promised. Chris truly is a professional and great at what he does. We're so glad he could demonstrate this during his visit. Please keep us in mind for any future HVAC or plumbing needs. Have a supreme day! Supreme Air is never going to be the cheapest provider, but their work is really excellent, and they stand behind it. Extremely professional and knowledgeable folks. Highly recommend them. Their service is always courteous, the technicians are well trained and competent and reliable. I cleaned both drain lines with the brush and blew out with compressed air. I poured hot water to flush the debris down the drain and to make sure it drained properly without leaks. I checked the electrical wiring and electrical systems, all are within specification. I replaced the filter in the upstairs unit, with one provided by the customer. Unit #1 had normal operating parameters. 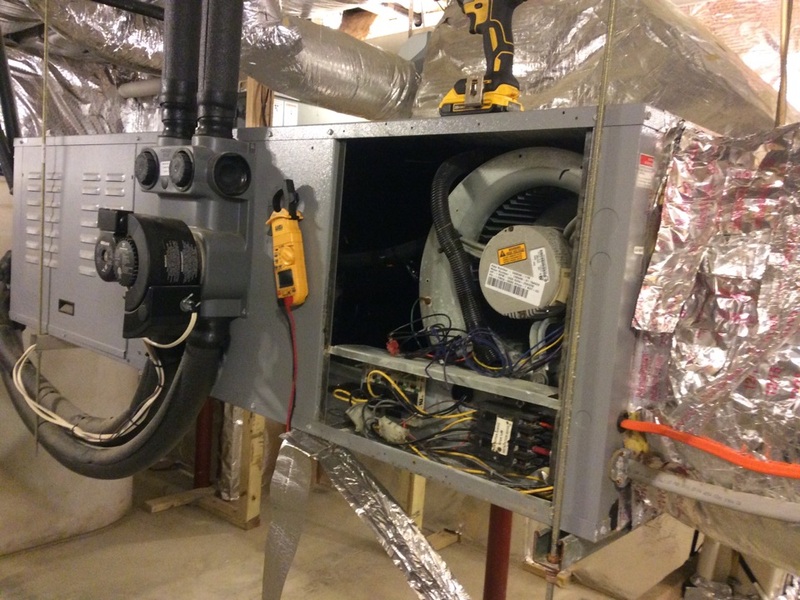 Unit #2, installed May 2018 had high Superheat and 17 degree delta temperature. I found no refrigerant leaks and added 2lb 8oz of refrigerant. I believe either refrigerant was not weighed in for the evaporator coil or additional lineset length. Both units are operating normal. Recommended to customer installing EZ Traps on each unit. Customer has main panel surge protector. I replaced the filter with one provided by the customer. I cleaned the condensate pan and drain lines and ran water to make sure it drained properly and that the condensate pump was working properly. I checked the electrical wiring and electrical systems, all are within specification. I recommend adding Intellistart module to protect the compressor. I confirmed proper flow rate and calculated heat of rejection. I pressurized the ground loop to 65 psi. I measured 20+ degree delta temperature across the evaporator coil. Unit operating normal. I pressurized the ground loop to 65psi. I cleaned the condensate pan and drain lines and ran water to make sure it drained properly and that the condensate pump was working properly. I replaced the filter with one supplied by the customer. Customer needs to order Aprilaire #413 filters, as there are none left. I checked the electrical wiring and electrical systems, all are within specification. I operated the unit on second stage cooling mode and measured 20+ degree delta temperatures across the coil. Flow rate was proper and the calculated heat of rejection was normal. Unit operating normal. I recommended installing a Blue Tube ultra violet light. In this instance there is a perfect spot for its to go in front of the coil and after the filter. I mentioned this to the customer and made an estimate. On arrival checked thermostat was calling for cooling. Measure EWT,LWT,EWP,LWP, return and supply temp,voltage amps,electrical connections,blower wheel clean contactor,replace filter 20x22x2 (2), checked operation. Custumer renew service agreement plan and paid in full,299.00. Unit is operating normal at this time. Upon arrival I installed zone board and found that the zone damper actuator was faulty and would not close. I went to the supply house and picked up a complete zone damper with new style actuator. I went back and installed original zone board and installed zone damper and tested the unit. The unit is operating normal. Customer had the price quoted from Donna of $593, which the customer paid today. I think the difference is that Yonas had charged the trip fee or something like that because the difference was $59. Customer wanted to see a billing code for zone damper replacement so I made one that I will send along with these notes and invoice. Found system tripped at breaker. Door panel door off saw no burn marks . Checked junction box and found the wire nut had melted and hit the cover causing the breaker to trip . Itâ€™s aluminum wire coming up and copper wire going to the unit . There was no noloc paste used and I think thatâ€™s what caused it to melt . Cut burnt wires and reconnect them . Also used noloc paste on all three connections and checked operations on system . On arrival found humidifier on the ground, we cleaned it, replace the panel, mounted it back, and sealed it with tape. Customer was not receiving enough heat inside the house due to humidifier was not on the right place. We tested it and checked the unit. System is operating normal. I operated the unit on low and high heat. I set the manifold gas pressures and checked supply gas pressure. I checked the electrical wiring and electrical systems, all are within specification. I operated the geo unit on second stage heat mode. I set the flow rate and confirmed heat of extraction. I pressurized the ground loop to 65 psi. Unit operating normal. Had to snake clean out from tub past toilet. Then had to lift toilet to snake main line to out home. Run water and no backup now. Keep an eye on tee under home where water closet set. Tub is running behind water behind water closet , which can cause tub to backup.